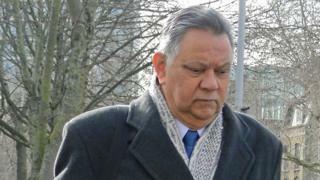 A former children's home boss who abused young boys decades ago has been jailed for eight years. Patrick Grant, 69, from Cardiff, was convicted at Inner London Crown Court of three counts of indecent assault at a south Wales home in the 1980s. Grant, the superintendent, would sneak into his victim's room at night and molest him under the bedclothes. He was also found guilty of three counts of indecently assaulting two others. One victim was assaulted between January 1976 and May 1977, while another victim was assaulted between February 1977 and February 1978. The latter offences took place at children's homes in Surrey and London. Grant was acquitted of a similar allegation in the late 1970s, and was then allowed to return to the profession. Some of the abuse for which he has been jailed occurred prior to his acquittal, but the abuse of a boy at the south Wales home took place after he had been acquitted. One victim, who was abandoned by his mother, went onto abuse glue and sniff petrol, and later turned to cannabis and heroin. He blames his behaviour on the abuse he suffered from Grant. In a victim impact statement he said he often fled from the south Wales home, and said: "Each time I ran away from the home I was picked up by the police and told them what was happening, but they did nothing." He was homeless in London for 24 years and once attempted suicide. He said: "Patrick Grant always said to me he would make me disappear. Words that have always haunted me." Recorder of Southwark Judge Usha Karu told Grant,: "You went into one boy's bedroom and touched his private parts under the bedclothes, sometimes over. "Once, when he wanted to say 'stop' you put your hand over his mouth." The judge added: "Each of these three victims have been severely traumatised by what happened to them. "This was undoubtedly a gross abuse of trust and use of threats, telling a child you would make them disappear and that nobody would believe them. "Each suffered severe psychological harm that they will carry for the rest of their lives." Regarding his acquittal in the 1970s the judge told Grant: "It could be said there was a shot passed across your bows, but you continued to offend."